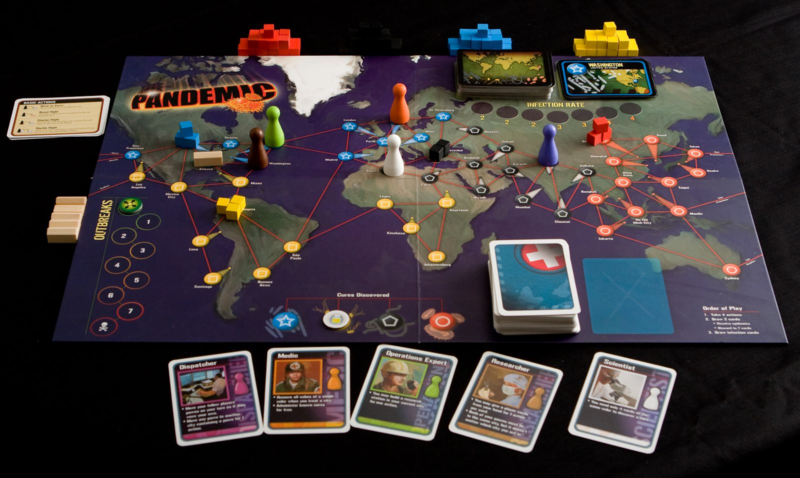 Pandemic is a cooperative style board game where everyone wins or loses together. It is a style of play that allows for open discussion and helpful to create a unique playing experience where working together is the only way to win. 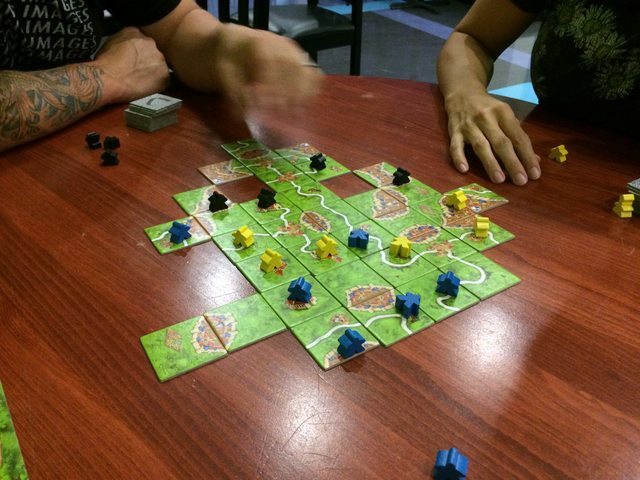 In 2015 a new game was release that has taken the board gaming hobby by storm. Pandemic Legacy: Season 1. 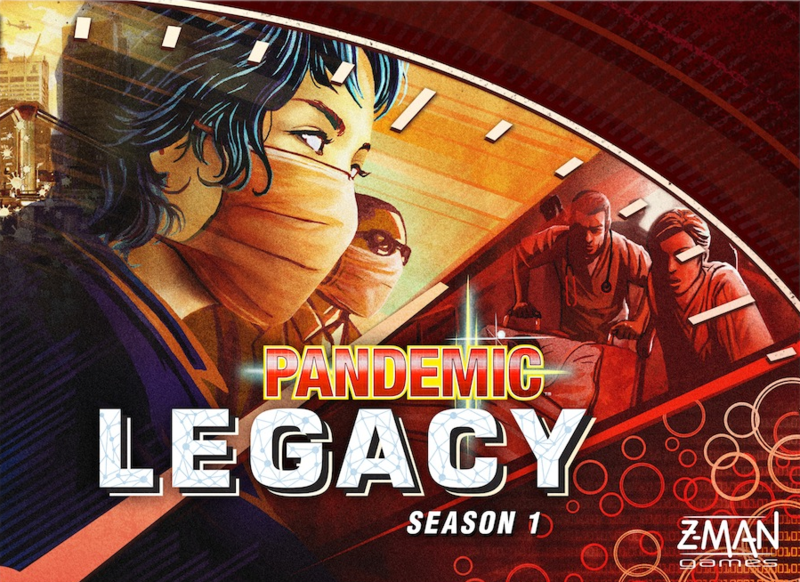 Pandemic Legacy is by design a non-replayable co-operative campaign game, with on overarching story-arc played through in 12-24 sessions, depending on how well your group does at the game. At the beginning, the game starts very similar to basic Pandemic, in which your team of disease-fighting specialists races against the clock to travel around the world, treating disease hotspots while researching cures for each of four plagues before they get out of hand. Here is the twist: the game changes permanently as you play. That's right. You will write on the board, tear game cards up and throw them away. As you play this game, it will be come unique to your group. So far, Pandemic Legacy, has been the best coop game of 2015. A big win at our first Game Night! 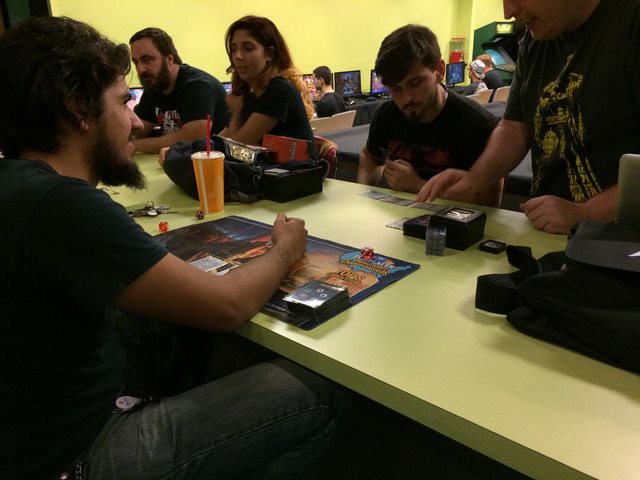 What a great turn out for our first Game Night! Carcassonne and Concept were big hits, as were some of the more classic games, like Uno and Jenga. I did get to beat my son in a game of Battle Line! I cannot tell you how excited I am for Thursday night! We have loads of games to choose from classic games to some new designer games. You will love it. For example, Fauna is a family favorite! Someone has to read the rules. You are probably reading this because you clicked a link that Rob (or a friend of his) sent you. That could mean 1 of 2 things. Probably both. He wants you to come and play some board games on game night at his house. and, he wants you to know more about this hobby. So, you probably know that we don't normally play Monopoly or Uno when we get to get together. Those are fine games, but there is so much more out there for you to try. We tend to play thematic, strategic or war games. Thematic games are ones that try to invoke a feeling through theme. Picture trying to escape a haunted house, or perhaps, being an adventurer, attempting to outwit one another to reach the Crown of Command or even being Robinson Crusoe. Thematic games, are not known for hard rules; they tend to be easy to play. Where they are short in strategy, they are dripping with narrative. Thematic games can take anywhere from 1-8 hours of play, with the average lasting between 1-2 hours. Strategy games, or sometimes called eurogames, usually have themes, but the theme isn't what is important. They tend to see how efficient you can build a farm or erect the best civilization. Strategy games tend to present you complex (or perhaps, elegant) systems designed to create decision trees. I know that doesn't sound fun, but if you love solving problems, you will love strategy games. Most of these kinds of games play in 2-4 hours. War games usually cover historical conflicts. Think of learning about WWII, not by reading a book, or watching a movie, but by making the decisions yourself; by taking the role of a commander, you can control the Western Allies in WWII and either recreate the historical outcome or maybe introduce a new time line. It all depends on you, and how the game simulates conflict. There are operational war games (from the 40,000 foot level) and there are tactical games (from the view of the individual squads). They are fun, but they are also studies in history. War games can take from 1 hour to a huge 50+ hours of game play! Remember, some war games recreate entire theaters of war! Most can be played in a day or two. 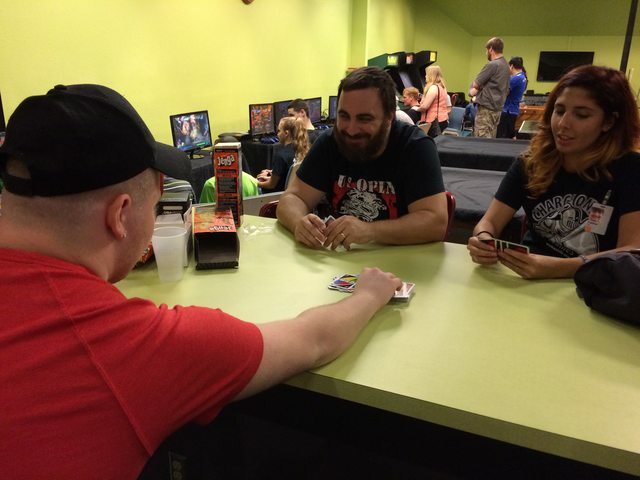 Playing games around a table can do several things for you and your friends or family. It will allow you to turn off the digital entertainment, and speak to each other face to face. Have conversations. Enjoy snacks, coffee or soda. Make decisions together. See how each other thinks. Work on your social skills and sportsmanship. Truly, gaming isn't about the games. It is about the gamers. It is about the people that you spend time with. Learning more about each other and having fun doing it. Drop a comment below if you are interested in learning more, or in starting your own group. 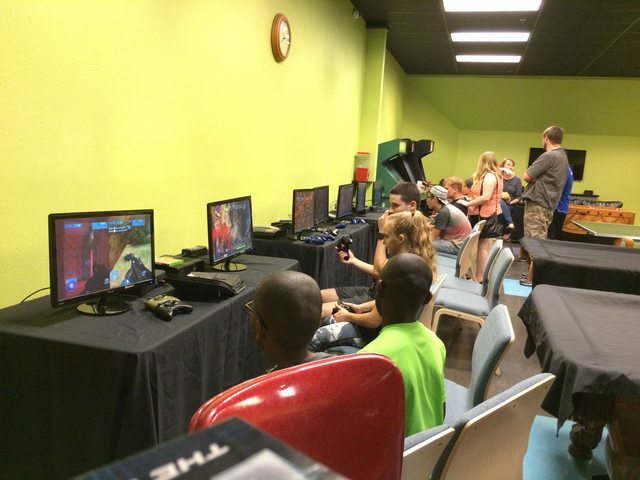 If you are in the Central Florida area, come and game with us! All images taken from boardgamegeek.com.